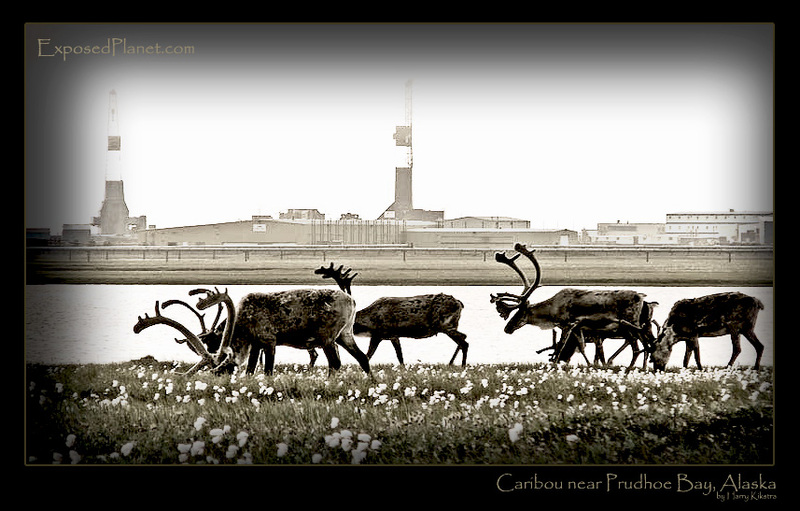 The story behind "Caribou near Prudhoe Bay, Alaska"
First of all, I hope everybody had a great X-mas! Now that X-mas is over, Santas reindeer (or caribou) can return to the Northern slope, Alaska, to graze amidst the cottonflowers at 70 degres latitude. That is, only close to the Arctic ocean, as the final stretch is completely owned by the Oil companies. But even that is not enough, as political (financial) pressure is put on lawmakers to lift the ban on drilling in the last remaining untouched wildlife refuge, the ANWR (Arctic National Wildlife Refuge). – Even Bush’s own staff has admitted that the drop in price will be about 1ct per gallon, which might happen after a decade.